Raspberry Pi, whilst doing a fantastic job of being a small and powerful computer, does this by a number of compromises. One of those is the limitations on its audio capabilities. Out of the box, Raspberry Pi provides good quality audio across the HDMI link, lower quality stereo audio by way of its 3.5 mm stereo jack, but no capability to connect microphones or other external audio sources, such as attaching directly to loudspeakers. The Wolfson Audio Card solves this by providing similar audio flexibility that would be provided by a PC soundcard. 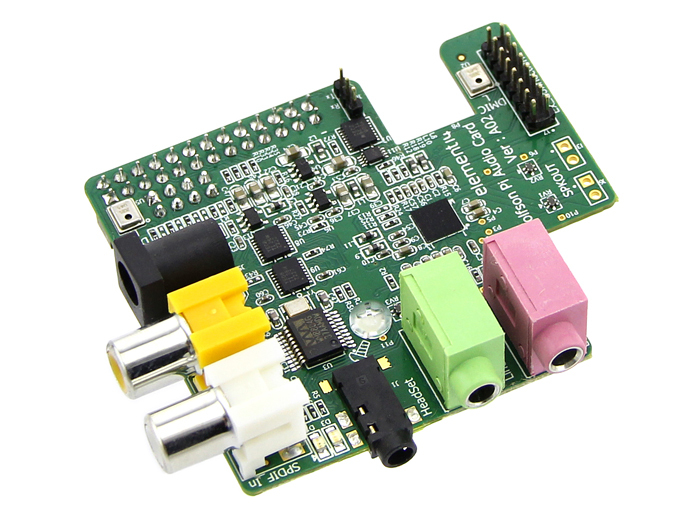 Not only this but the Wolfson Audio Card was produced in partnership with Wolfson, the premier audio solutions chip company, to produce superior sound capabilities for the Raspberry Pi. The Wolfson Audio Card is based on Wolfson WM5102 audio hub codes. The WM5102 is a highly-integrated low-power audio system for smartphones, tablets and other portable audio devices. It combines wideband telephony voice processing with a flexible, high-performance audio hub CODEC. The WM5102 digital core provides a powerful combination of fixed-function signal processing blocks with a programmable DSP. These are supported by a fully-flexible, all-digital audio mixing and routing engine with sample rate converters, for wide use-case flexibility. Two stereo headphone drivers each provide stereo ground-referenced or mono BTL outputs, with noise levels as low as 2.3μVRMS for hi-fi quality line or headphone output. The CODEC also features stereo 2W Class-D speaker outputs, a dedicated BTL earpiece output and PDM for external speaker amplifiers. A signal generator for controlling haptics devices is included; vibe actuators can connect directly to the Class-D speaker output, or via an external driver on the PDM output interface. All inputs, outputs and system interfaces can function concurrently.